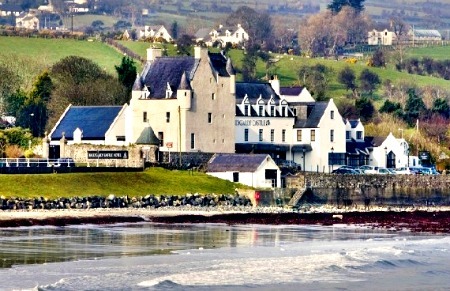 Ballygally castle was built in 1625 by a Scottish man named James Shaw, who rented land in area from the Earl of Antrim. The castle has seen its fair share of trouble throughout its lifetime, coming under attack several times from a nearby Irish garrison at Glenarm during the rebellion of 1641, but each attack failed and the castle stood. The Shaw family owned the castle until it was sold by William Shaw in 1799 for a grand sum of £15,400. In its more recent history the castle was bought by a carpet tycoon named Cyril Lord who performed renovations and expansions on the property. It was later sold to the Hastings Hotels Group and is open to this day as a very pleasant place to stay. The castle has had reports of ghostly activity almost since the very beginning, with the most well known and certainly the most active being the spirit of a Lady Isobel Shaw. The story goes that she and her husband had quite an unhappy marriage and after a row one day he locked her in one of the upstairs room. He left her to starve in there and her desperation led her to attempt escape by the window. This led to her falling to her death and it is said that her spirit lingers within the castle. Though she is thought to be friendly she certainly seems to enjoy playing tricks on guests. She has been known to knock on many of the doors from the outside only to have vanished by the time someone opens them, seeing no trace of anyone on the hallway outside. The castle is thought to be packed with ghosts, with psychic investigation groups claiming there to be more ghosts than guest rooms in the hotel. Other paranormal activity here includes hearing unexplained noises, such as muffled talking and crying coming from empty areas. There is also the disturbing reports of people who say they have felt a hand being gently placed on them while they sleep, only to find the room empty upon waking. In 2003, owner Olga Henry had said after spending some time in the hotel, "I'm sort of very skeptical about the whole supernatural thing and ghosts. But the more I stay here and work here, the more I think there's definitely something in this hotel." If you are interested in seeing any of the ghosts in this fine building them go ahead and book a room in this beautiful old building, and you never know, something might pay you a visit while you sleep.